Pieter Scholtz of Isuzu Southern Kings faced a Disciplinary Hearing today via video conference and has been banned for three weeks. 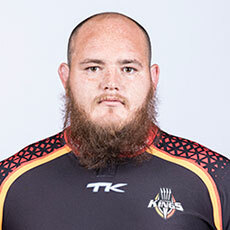 A Disciplinary Committee met in Dublin (Ireland) to consider the citing against Scholtz (No 3) of Isuzu Southern Kings which occurred against Edinburgh Rugby on Saturday, January 5, 2019. The player was reported by the Citing Commissioner in charge for alleged infringement of Law 9.12 – A player must not physically abuse anyone. Physical abuse includes but is not limited to, contact with Eye Area. The Disciplinary Committee comprising of Michael Coghlan (Chair), George Spotswood and Donal Courtney (All Ireland) concluded that the player had committed an act of foul play of contact to the eye area. In upholding the Citing Complaint the Disciplinary Committee deemed that the offence merited a red card with a low-range entry point of four weeks. The panel did not find any aggravating factors and applied mitigation of one week in respect of the player’s admission of facts and his presentation at the hearing. As a result, the player is banned for a period of three weeks and is free to play from midnight on Sunday, February 3rd 2019.